If you are a heavy traveler, then you surely know that traveling has its advantages and disadvantages. Spending most of your nights in hotel rooms with the air conditioner turned on all the time can lead to serious health conditions, such as breathing problems, sinus infections, allergies, or minor affections such as dry skin, continuous headaches or sensitive eyes. When this is a one-time situation, it is somehow bearable, but when it turns into a habit, it can be really annoying. One of the best options that you have when sleeping a lot in hotels is to use a humidifier. Yes, we know what you are thinking about! How can you carry your home humidifier with you in your travels, when you barely have room for all your personal belongings in your luggage? 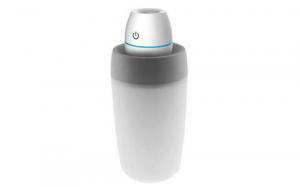 Travel humidifiers are the answer to most of the problems mentioned above! These amazing devices are small-sized and can be “paired” with water bottles in order to offer you the level of moisture that you need in the air you breathe. They are highly portable, easy to use and can help you avoid congested sinuses, headaches, dry skin, coughs and many more. Most travel humidifiers are affordable, nicely designed and occupy very little space in your luggage. Also, some of them are equipped with smart systems that automatically shut down when the water level reaches the lower limit. More than that, the humidity level can be easily regulated using the adjusting buttons of the devices. Are you looking to buy a travel humidifier that is practical and innovative and that can give you the exact level of moisture that you need? We have reviewed the 7 best-selling travel humidifiers that the market has to offer right now, in order to give you an idea about the options that you have. Take a look at the products below. Although most people don’t like the idea of having to stress about carrying a water bottle with them in the hotel room just to use the humidifier, it is a great idea if you want your device to occupy as little space as possible in your suitcase. Also, it makes your luggage much lighter and easier to organize than humidifiers that include a water tank. This mini-compact device from CLBO is small and compact and does exactly the job it was created for with the help of a water bottle. 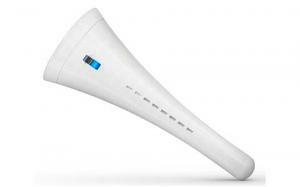 It uses ultrasonic concussion and mute technology, so that you can’t hear it during the night. The sound that it makes is below 25 decibels, which is great. Besides being silent and highly practical, this product is also safe, as it shuts-off automatically when the water runs out. Whenever the water in the attached bottle is fully used, the blue light of the humidifier turns red. The device has a control know that allows users to adjust the humidity level, as well as the density of the fog. Thanks to the extremely low level of radiation, it is suitable for the child’s room and safe near pregnant women. A humidifier with style is brought to you by Fancii, a manufacturer that puts an emphasis on modern design. If you want to complete the design of your room or office with a device that is stylish and compact, then you will love this product. It is a lightweight mini-humidifier that is suitable for bedrooms, tents or offices and that works using a separate water bottle. Unlike most humidifiers, this one is cordless and can make your life so much easier, by eliminating the need to find a plug wherever you want to place it. It runs on batteries or can be simply connected to a USB port. This product comes with an adjustable timer and safety features that protect it from overheating or burning when the water level is too low. It shuts off automatically after 8 hours of use, too. It comes with 3 filters that have to be changed every 2 months and it includes a USB cable. However, the batteries are not included, so you will have to buy them separately. If you want an extremely silent product for your bedroom, then you will be glad to know that Fancii’s product operates at less than 15 decibels. 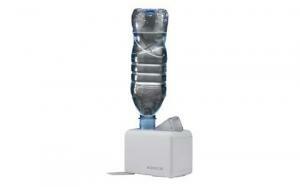 A good travel humidifier doesn’t have to be expensive to fulfill your requirements. This product comes at a great price, it is highly portable and is very easy to use. All you have to do is place a water bottle upside down in the device’s slot. It turns into a practical water tank that operates for up to 6 hours. The device has an adjustable knob that lets you set the desired humidity level, which is very convenient because you might feel comfortable with a different moisture level than other users. It is great for night use, as its noise level is extremely low and it shuts off automatically when no water is being detected anymore. Its size of 7.4 x 6.1 x 4 inches is ideal for traveling. Also, at its 1.2 pounds, it is lightweight and easy to carry around. What’s to like about the Travel Ultrasonic Humidifier? The two most important reasons why you should choose this product are the portability and adjustability features. However, it is also important that the device is covered by a 2-year warranty, which makes you think that it was built with durability in mind. Moreover, it is silent, it has safety features that are great and it comes with a bottle base and a brush that helps you clean it whenever necessary. Although this product does everything that promises to do, it comes with an LED light that can be annoying for some of you, as it is quite intense and might bother you if you are trying to sleep. If you need a travel humidifier that has a large capacity, this is the right product for you. It comes with a high output of 1 gallon and it can last for up to 24 hours. It is highly portable and ideal for hotel rooms. It is especially made for travelers and it includes a travel bag that makes it easy to carry around and store in your luggage. Also, it comes with an interchangeable plug, which makes it suitable for worldwide use. Its size of 2.6 x 4.4 x 3 inches is larger than most portable humidifiers’, but it is still great for those who really need their hotel rooms to be humidified. However, at its 1.6 pounds, it is lightweight and easy to carry. It is equipped with a blue LED light and it has a vapor mist function and although it is practical and efficient, it doesn’t have an auto-shut-off function. What’s to like about the BONECO Travel Cool Mist Ultrasonic Humidifier 7146? This high-output humidifier is ideal for those of you who travel often and have breathing issues, headaches or dry eyes because of dry hotel rooms. It comes with an adapter for conventional bottles; it has a travel bag and is very easy to clean. Moreover, it is quiet and compact and represents a solution to all of your health concerns regarding the moisture in the air around you. Being a larger product than most similar travel humidifiers, it is considered normal to have a higher price. However, one of its flaws is the lack of an auto shut-down function, which would be a great safety feature. A classic humidifier isn’t enough for you? Than this inexpensive, modern and unconventional travel humidifier will blow your mind. It is not just nicely designed, but it is also versatile and you don’t even need a water bottle in order to make it function. This product comes with a 9-feet long cord and a USB connector that can be inserted in any slot, be it your laptop’s slot or other device’s. It has an automatic shut-off function that protects the device from overheating. After 8 hours of use, it shuts down by itself, as well as when water cannot be detected. One of the best things of this product is that it can be placed in a glass of water or any other recipient and you don’t have to worry about carrying around a water bottle. Simply remove the internal filter wick before using it, soak it in water, put it back and enjoy the delightful mist. What’s to like about the Cool Mist Travel Humidifier Stick, Desk Top Mini Portable Personal Ultrasonic USB Powered Pure Air with No Fan? Except for being highly functional and built with good taste, this product is amazing for travelers. It measures 6.2 x 2.6 x 2.5 inches and weighs 4.8 ounces. Its internal filter must be replaced every 3 months, so it needs minimum maintenance. This is a great product for those of you who need a low level of humidity in their room, but it is not suitable for those who like the air to be extremely well moisturized. It doesn’t have enough power for that, but it is great for other user categories. Yet another lightweight and practical travel humidifier, Bell+Hower’s product comes with a simple, compact design and a great price. It operates quietly, so it can be used while you sleep and it has adjustable humidity settings, which means that it can be used by the entire family, depending on their needs. One of the best features of this product is the UV germicidal protection. It makes it suitable to sensitive users who tend to develop allergies and must protect themselves from germs and bacteria as much as possible. Its size of 4.4 x 2.9 x 4.5 inches and weight of only 8 ounces makes it suitable for traveling. It comes with an AC adapter and needs to be plugged in in order to work. 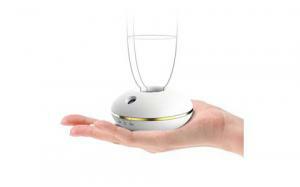 What’s to like about the Bell+Howell Ultrasonic Personal Portable Humidifier-Cool Mist? The one thing that most people complain about is the impossibility to turn off the blue light when needed. It can be quite annoying, but other than that, it is a nice little humidifier. An ultrasonic humidifier that comes with an equally modern design, the Crane USA EE-5950 releases a large amount of mist and is ideal for travelers due to its small size. It is compact, it has a nice shape and it measures no more than 7 inches in height and 3 inches in width. You can choose between grey, white and black and rest assured that your luggage will only get 2 pounds heavier. This product is affordable and runs for a longer period of time than most similar humidifiers. IT will release a cool mist for approximately ten hours when plugged in using the included A/C adapter. It also includes two spare filters. By comparison with the above four products, this one does not require a water bottle or any water container, as it has its own tank. What’s to like about the CRANE USA EE-5950 Travel Ultrasonic Cool Mist Humidifier, 8 oz? Except for the already mentioned advantages, this travel humidifier is made of materials that are antimicrobial and protect you from germs and bacteria. By keeping these away, you won’t get in contact with such contaminants when carrying, using or maintaining this product. Also, it has an auto-shut-off function that ensures the safety of the device. As previously mentioned, this product releases a higher amount of mist than the usual small humidifier, which is why you should place it at some distance from your sensitive objects and even from your face, or you will get all wet when operating it. Is a travel humidifier able to help you with your allergies? A travel humidifier is basically a personal device that you can set however you want, depending on your needs. Giving the fact that such a device is recommended for people with respiratory issues, it is also good for allergies. Dust, different types of mites and pet hair are just a few of the possible allergy causes that you probably choose to treat using drugs. If you have severe symptoms, it is obvious that you should not stop taking your medicines, but you should think of alternative solutions to solve them. Humidifiers that include aromatherapy diffusers are ideal in this case, as the use of essential oils is well known for its great effects on the breathing system. If you are worried that your airways will be dry every time you sleep in a hotel room, then you should definitely buy yourself a travel humidifier. Some models have their own container, while others can be used with a simple bottle of water and therefore, occupy less space in your luggage. However, this kind of device can be used even if you aren’t allergic to something. When the air in a room is too dry, you risk developing respiratory issues over time, get a sore throat and have an uncomfortable sleep. Why is a humidifier recommended for dry skin? The first effect that you will notice if the air in your home or hotel room is too dry is that your skin will start to itch. A humidifier that releases just the right amount of mist helps to moisture the air and therefore, your skin will be moisturized, too. The humidity level in the air will increase immediately and you will wake up hydrated and healthy. What happens if the air in the room your work or sleep is too dry? Having a sore throat or dry skin aren’t the only consequences of dry air. It can lead to dehydration and chapped skin and dry sinuses. Also, the probability of catching airborne viruses is extremely high. You might even start to cough without understanding why. There are even more problems that you could be confronted with. Static electricity doesn’t dissipate naturally, so you might notice that the blankets stick together. Did you ever experience electric shocks when touching certain fabrics, a metal surface, a doorknob or even your computer? Then dry air might be the cause. Another important aspect that you should keep in mind is protecting your home and furniture. When the air is too dry, moisture is absorbed from everywhere, especially from the structure of your home. The next thing you know, your walls and door jambs start to shift, the doors become more difficult to open or close and the gaps between the ceiling and walls become bigger. The best option that you have in all of these situations is to ensure that the humidity in the air is at the right level. This way, you can prevent all of the above risks. Choosing the right humidifier for your needs is essential, from a variety of reasons. 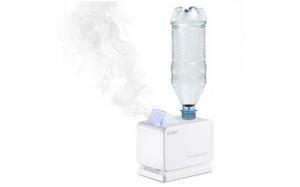 The health factor is the main reason why most people choose to buy travel humidifiers that can be used in hotel rooms. They help you breathe more easily, they reduce the snoring, the sinus aches, the headaches, the dry eyes and skin and many more. But when the humidifier you decide to buy does not do its job the way it should, waking up in the morning with the same awful sensations can be really irritating. Avoid the discomfort that you used to experience in the hotel rooms you slept in until now. Buy a humidifier that has the right output that releases the amount of moisture that you need and that is easy to use. Also, do not underestimate the importance of its size and design. The smaller and the more powerful, the better. Minimalism is highly appreciated these days and for good reason. Embrace the comfort that a travel humidifier can help you experience by choosing the best model for your needs!